Hi all you lovely Honeybear Lane readers. I’m delighted to be Heidi’s guest today!! 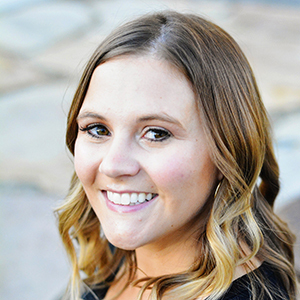 My name is Kara and I blog over at Happy Go Lucky. Today I’m going to share an easy way to display all those fabulous holiday cards you’re getting in the mail. I was inspired by this snowflake card holder from Pottery Barn. I decided to make a similar one using ornaments and ribbon. Start by painting the mini clothespins the same color as your snowflake ornaments. I painted mine red. While the paint is drying, wrap or hang your ribbon. I wrapped mine around the hall closet door. I started with two rows for now and can add more depending on how many cards we get. Using your glue gun, attach the snowflake ornaments to the clothespins. Use the clothespins to hang your cards on the ribbon. Then step back and admire your fabulous holiday card display. It was so easy to make! I love anything with glitter – especially around this time of year. So how do you display your holiday cards? I’d love for you to share your fabulous ideas with us today. Thanks Heidi for having me today! I had a blast sharing this fun card holder with you all. 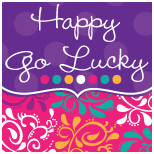 I hope you’ll stop by Happy Go Lucky and say Hi – I’d love to have you! What a clever idea! Kara is so dang creative, I love her!